Get a FREE Pack of Upper Deck NHL® cards on National Hockey Card Day! Fans can visit participating retailers to get National Hockey Card Day packs and uncut sheets on Saturday, February 23, 2019. 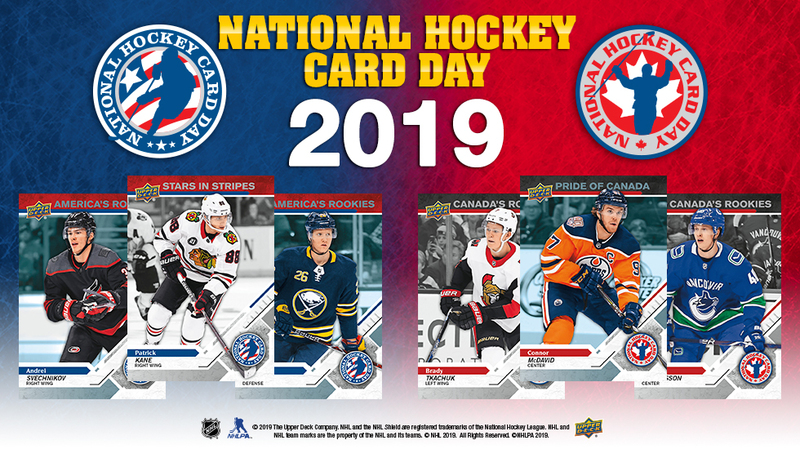 Make sure to share your National Hockey Card Day experience on social media by using the hashtag #NHCD and check out the National Hockey Card Day Facebook page. Product depicted for demonstration purposes only and is subject to change without further notice. © 2019 The Upper Deck Company. 5830 El Camino Real, Carlsbad, CA 92008. All rights reserved. NHL and the NHL Shield are registered trademarks of the National Hockey League. All NHL logos and marks and NHL team logos and marks depicted herein are the property of the NHL and the respective teams and may not be reproduced without the prior written consent of NHL Enterprises, L.P. © NHL 2019. All Rights reserved. ©NHLPA. Officially Licensed Product of the NHLPA. NHLPA, National Hockey League Players’ Association and the NHLPA logo are trademarks of the NHLPA and are used under license.